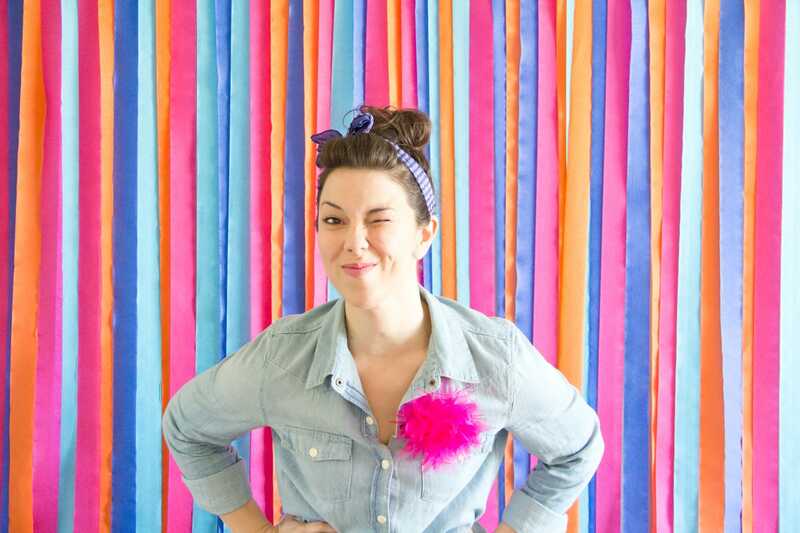 Photo backdrops are so fun! 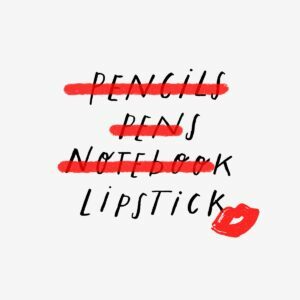 And they’re even more fun when they’re easy and affordable. 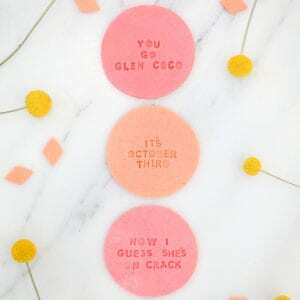 This classic project was one of our first photo backdrops and has since become one of our most recreated DIYs! 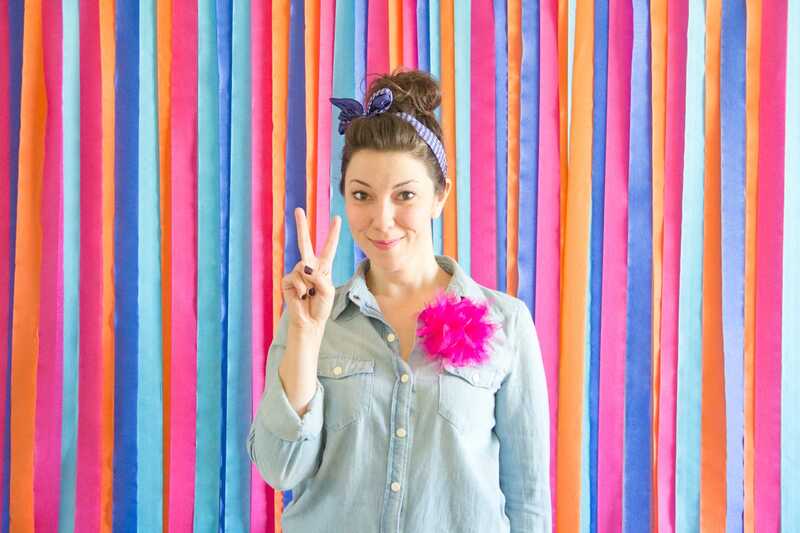 And I can almost promise that you’ll want one of these backdrops at your next shindig after we show you how to make a photo backdrop out of streamers. We’ve got quite a library of photo backdrops these days (you can see them all right here! ), but none of them is as easy and cheap as this one, especially since it still packs such a visual punch. 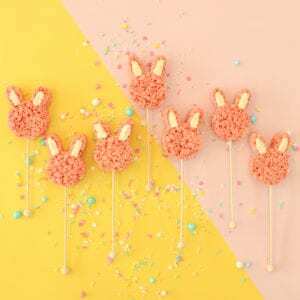 It’s perfect for customizing because you can create it as large or as small as you like, and you can tailor the colors to your party theme. To best utilize this backdrop, make sure you have a nice plain wall with open space in front of it. 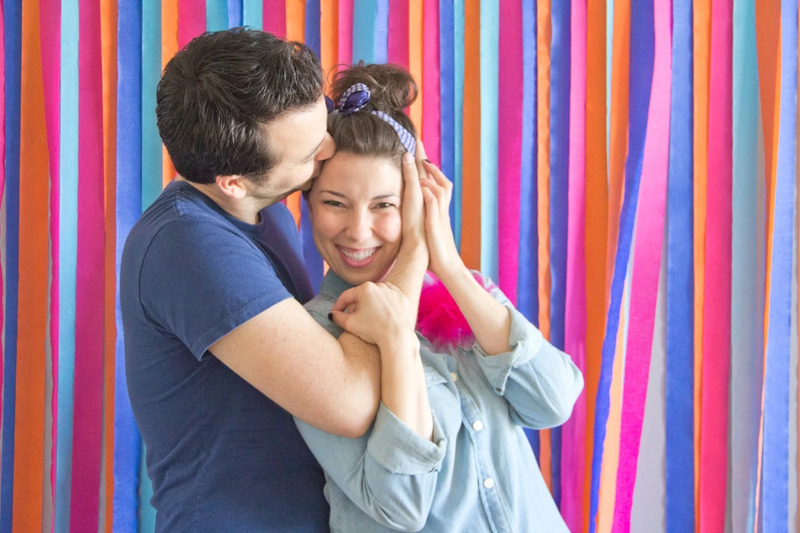 You’ll use masking tape to adhere the backdrop to the wall, so there’s no risk of damage at all. Start by deciding the dimensions and height of your backdrop. 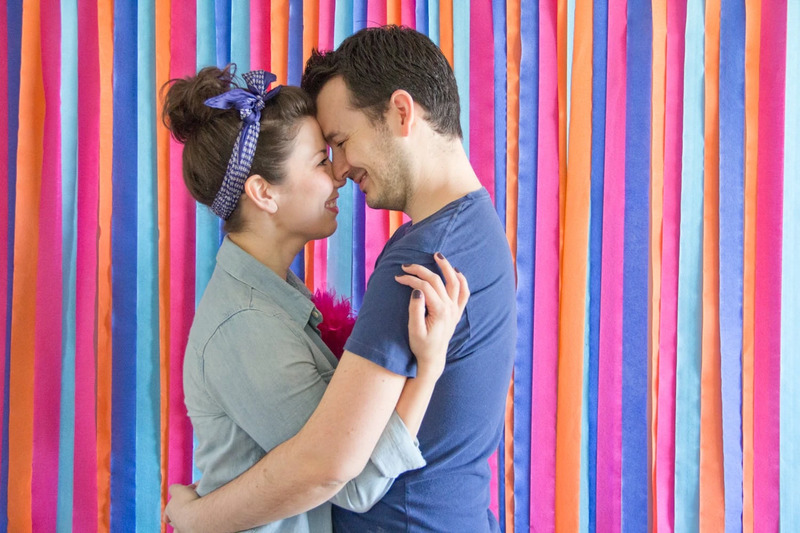 This particular backdrop is meant for photos of your guests’ torso and head — not full body. So this backdrop is four feet tall and five feet wide, and starts about 30 inches off the ground. 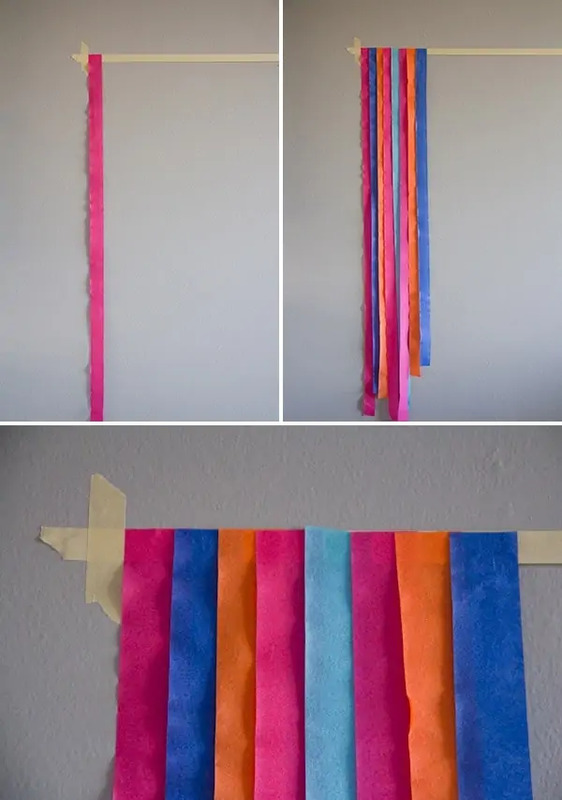 If you’d like to make something larger, just go wider on the sides, start the streamers at a higher point on the wall, and take them all the way to the floor. 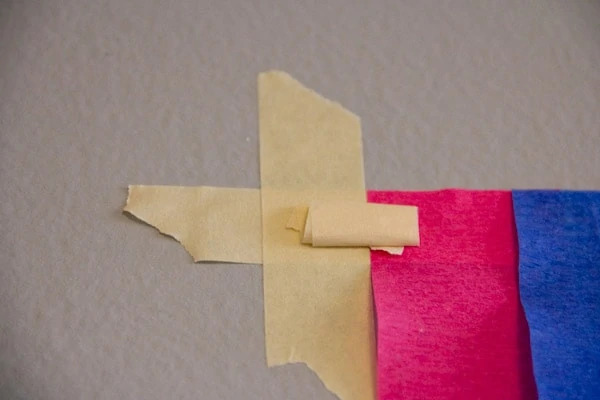 At the top of your backdrop, stretch a piece of masking tape sticky side out, and tape it to the wall with two smaller pieces. The long piece of tape needs to have the sticky side facing outward so that you can stick the crepe paper to it. 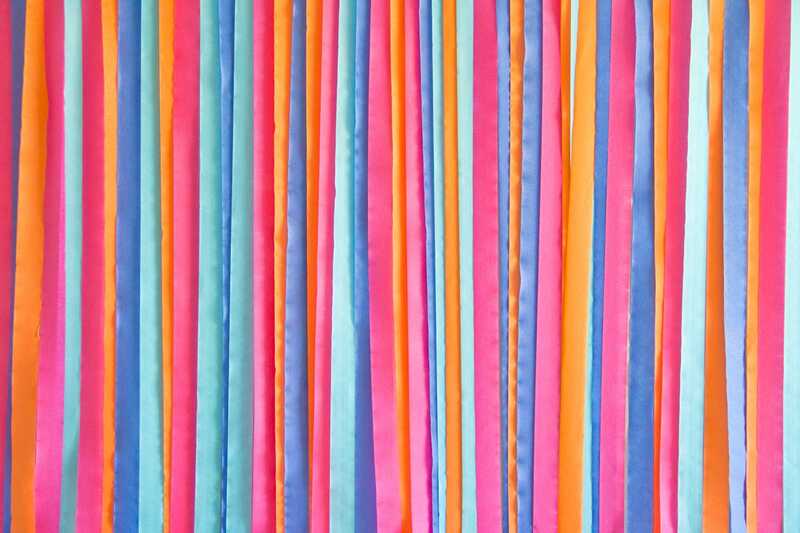 Start attaching pieces of crepe paper, a little over four feet long. Snip the ends so that they’re square and match up the edge with the masking tape. Overlap the pieces slightly. Continue this way until you’ve worked your way across the entire backdrop. Roll a few pieces of masking tape so that they’re double-stick, and spread them across the top of the backdrop. 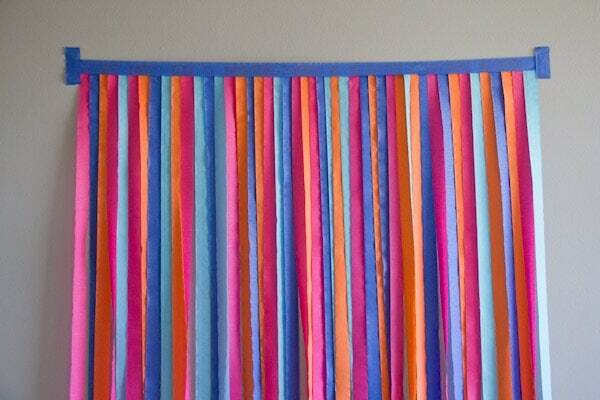 Cover the top edge with a long piece of crepe paper to mask it and give it a clean finish. Do the same on either end to cover the smaller pieces of masking tape. At the bottom, stretch a piece of masking tape across all of the crepe paper, sticky side in. 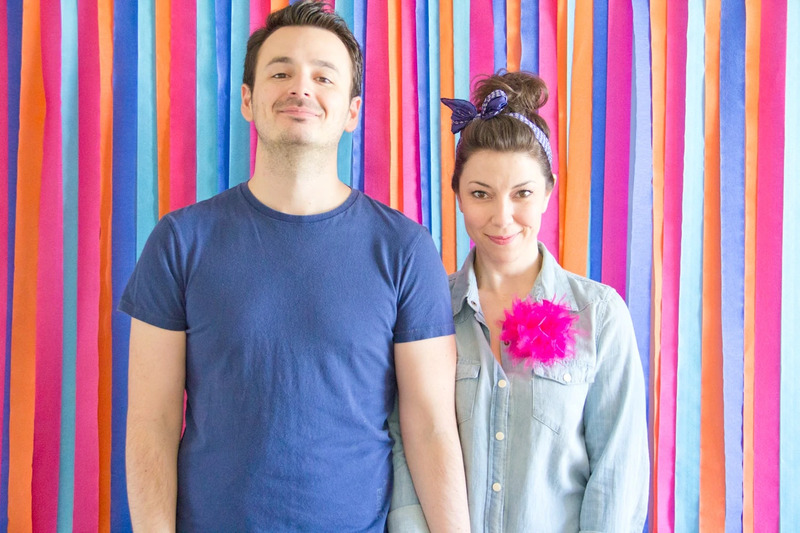 The goal is to contain all of the streamers so that they don’t fly out of place during photos. Mask the bottom with crepe paper using the same method that you did on the top. 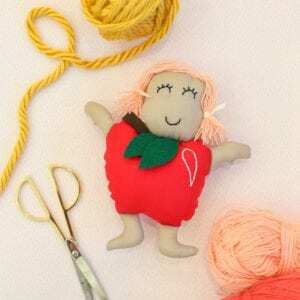 Snip the uneven edges of crepe paper so that all of the ends are hidden. This is a great idea, so full of color. Its makes a great backdrop. In der Zweiten Liga verlor Union Berlin 0:2 gegen Paderborn und rutschte auf den 14. Das Herzstück oder das Innere eines jeden Hauses wird schon sehr lange von Menschen durch Dekorationsartikel oder Tapeten verschönert. Love this. So simple and so effective. I love this idea! I want to try it for my daughter’s first birthday party. We’re not having it at home, and the only place we could put this would be on a fence. Do you have any ideas about how we could attach it to the fence? 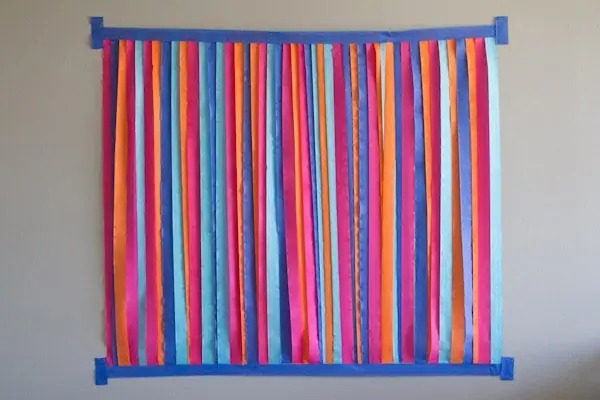 I was thinking maybe taping both sides and then making a little loop with hot glue and sticking rope or twine between to tie it to the fence. Hi Laurielle! What kind of fence is it? 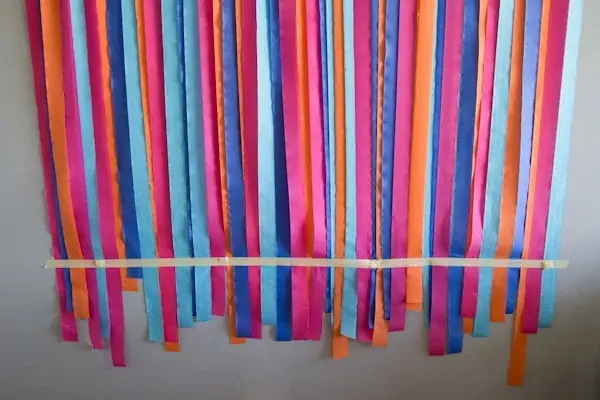 If it’s wooden, perhaps you could use thumbtacks at the top of the fence to hold the streamers at the top. Just love this idea, so simple yet looks fab! thank you for this article very helpful for me. 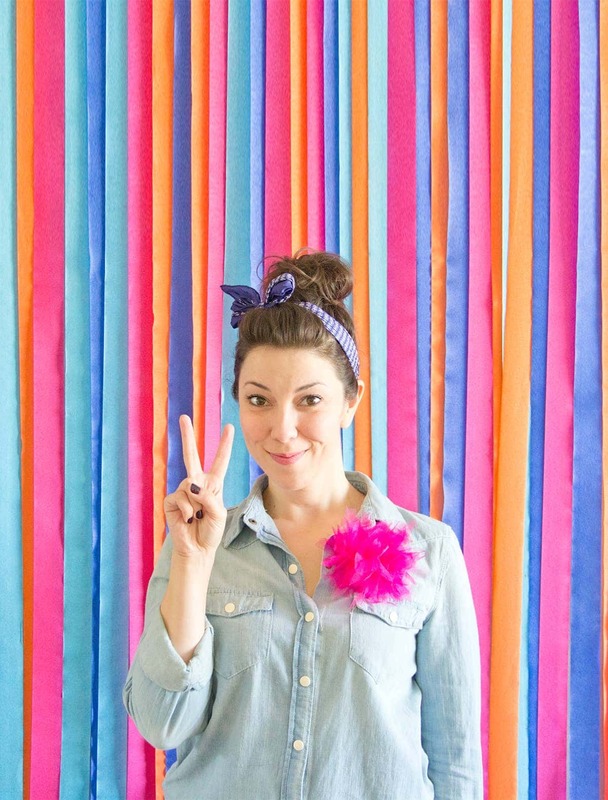 I love your backdrop ideas! 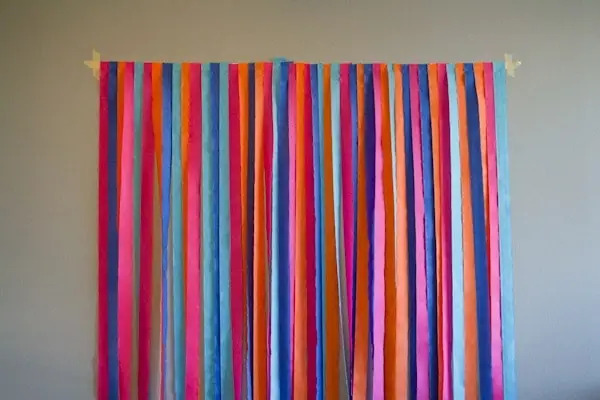 Can I use a wire to attach the streamers to, to put over a door for a backdrop instead of tape. Hi Gwen, thanks for your question! You could try wrapping the ends around a wire. They might to better with something flat, so you could get some duct tape or similar, and put two strips back to back so the sticky part is covered up but it creates a flat base. Then tape the ends of the streamers to the duct tape base. Let me know if you end up trying something that works! I really liked the tip. I was uncreative, looking for a photo in the background. That way it got better, and excited my curiosity. I love this! Thank you for sharing. I want to try this and am wondering if it would stay up on a wall without coming apart if I set it up a day in advance ? Hi Michelle! I would test out your tape a few days ahead of time. As long as you have tape that sticks, the rest of the installation will stick with it! 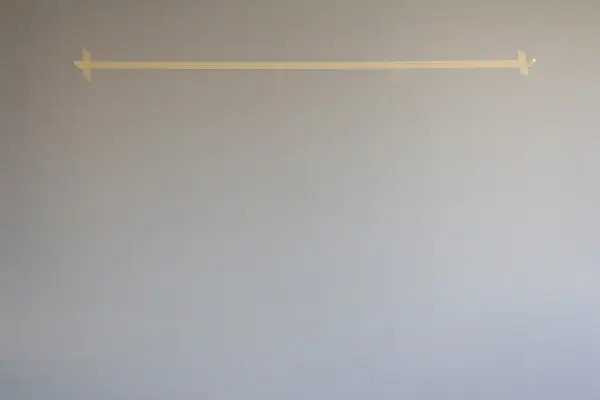 I’ve had good luck with masking tape and painter’s tape, just be sure to test it on your walls because the type of paint you have will make a difference. Be sure to send a photo if you try it out! Approximately how many rolls of crepe paper does this take? Hi Tina! I would get 4-5 rolls to be safe.